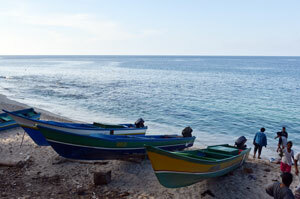 A small boat with a crew of five lands in Labuan Lombok, a small fishing town on the east coast of Lombok. 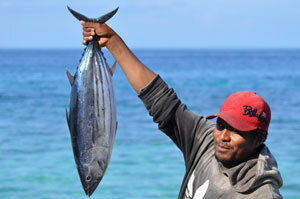 Two enumerators measure the catch, and they interview the captain, Rahman, on fishing grounds and other details of his eight-day fishing trip. Using a run-of-the-mill desktop computer at a local WARNET (Warung Internet, Indonesia's ubiquitous internet cafe), they enter their data in a spreadsheet, and they upload the spreadsheet to a website. A couple of hours later, the trader who advanced Rahman's operational expenses for this trip accesses the website to get an overview of the species composition of Rahman's catch, the quality of the catch, plus a month-to-date summary on the catches of her boats. In Mataram, the province capital, an official of the fisheries agency (DKP), accesses the same database online to get an up-to-date overview of the area where most skipjack and yellowfin tuna was caught over the past six months, while a researcher from the University of Mataram downloads catch-per-unit-effort data to conduct a stock assessment with specialists from the Fisheries Research Center in Jakarta. Availability of accurate data on fish stocks and fisheries is one of the bottlenecks for effective fishery management in Indonesia, and the USAID-funded Indonesia Marine and Climate Support program has been working on various data collection projects in Indonesia. I-Fish is one of the tools that IMACS is developing to address the urgent need for an effective and flexible data management platform. The primary objective of I-Fish is to inform fishery management, and the secondary objective is to help captains and traders with operational decisions on fishing practices. The database contains information of the catch composition and operational details of fishing trips from a selection of fishing trips within a particular fishery. IMACS is piloting I-Fish for the yellowfin tuna and skipjack tuna handline fishery in the waters to the North and South of Lombok and Sumbawa, eastern Indonesia. Note that the database does not provide information on the total annual catch volume of a fishery or of the total catch of a particular boat. Data on fishing grounds is recorded and stored in a grid of roughly one degree by one degree, which means that fishers do not have to worry that the database gives away their secret fishing spots! Since there is much variation in operations and logistics between fisheries and locations, data collection protocols must be tailored to each situation, and therefore I-Fish requires development of a data collection protocol that is specific for each fishery. A “fishery” is a group of vessels, usually of similar size and using similar gears, working on a specific species assemblage within a well-defined area. An example is “the trap fishery on blue swimming crab in the waters to the southeast of Buton”. Ideally, a fishery is defined in such a way that it comprises a “unit stock” (or an ecosystem) in its entirety. researchers have access to all details. Of course, the database also provides summaries of data for quick interpretation of status and trends. I-Fish provides all users with access to the same data, which means that I-Fish provides a shared “truth”. Of course, different users have different needs, and therefore I-Fish presents the data in ways that are customized for each particular user. A trader, for example, will get an overview of the annual average fuel consumption per trip and the average catch composition by quality category, whereas a researcher will get summaries of the length-frequency distribution of each species in the catch. error-checking, for example to ensure that enumerators do not fill in zeroes as character “o” (as in “oops!”). After transferring the data from the paper form into the spreadsheet, the enumerator uploads the form to a website. The website receives the data, performs checks on data quality, and automatically parses the data from the spreadsheet into the database. 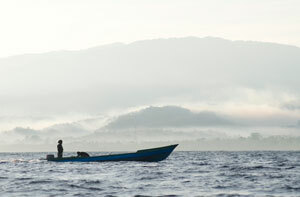 of Nusa Tenggara Province, and its members comprise fishing companies who participate in the tuna fishery of aforementioned waters, as well as government officials. Willingness to contribute data (i.e., to allow enumerators to work at their facility) is one of the criteria for membership to this Committee, and members get customized data reports on catch composition and fishing practices. Besides private sector members, the following agencies also have access to the database: University of Mataram, the District Fisheries Agency (DKP) of Lombok Timor, the Province Fisheries Agency of Nusa Tenggara Barat, and the Fisheries Research Center (P4KSI). and responsibilities with her modified application. The tools with which I-Fish was developed are also open and free, which means that the only costs for further development and deployment comprise Internet connectivity, server fees, and professional fees for developers. runs on Linux with Apache without modification. IMACS is developing a similar system in Ruby-On-Rails, which offers a more agile development environment. For data entry, I-Fish now uses Microsoft Excel spreadsheets. This is the only proprietary software that I-Fish requires, and we are currently looking into replacing Microsoft Excel with one of the open-source spreadsheet programs. improvements to the database application over the coming year, especially in respect to reporting, so please make sure to check in regularly! Of course, we are most interested to hear your suggestions and comments. This website is developed using Drupal Content Management System (CMS) Version 7.0 and PostGreSQL version 9.2 Database Server. You need to login in order to access this resource. Please register or send us email to get user account to [email protected]. To see the source code, please follow link https://github.com/mohamadlutfi/IFish. IMACS is also developing application module for fishery statistic that can be accessed at http://fishstat-staging.herokuapp.com, and application souce code at https://github.com/ahharvey/export_system.